Get the ideal window blinds for your space with our help. Windows are a great way to let in light, make a space feel airy and open, and define a space. However, when the light starts to fade or your neighbours are just a bit too close, you want to be able to block out those windows for a little bit of privacy. The best way to accomplish this task is with some great window blinds from Ashtons Blinds! 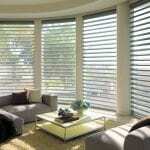 Here in Owen Sound, Ontario, there’s simply no one better than Ashtons Blinds for all your window treatment options. We want to be your go-to window blinds specialists. We have all kinds of window blind options for you to choose from. With everything from cordless blinds, honeycomb blinds, motorized blinds, Venetian blinds, roller blinds and more in a variety of styles and colours, you can find a window blinds option for every window in your property! We understand here at Ashtons Blinds that all our window blinds options might be overwhelming for you, especially if you have a hard time picturing something in your own space. For your convenience, we have in-home consultations where we are able to show you our entire stock or portions of it in the space you’ll actually use them, making decisions much easier. Once you have chosen your window blinds, our qualified and experienced professionals will install them directly for you. With the quality window blinds that we stock, we know that you’ll enjoy your window blinds and all their privacy features from Ashtons Blinds for years to come. Contact us today for more information!